While the following excerpt taken from the Gulf Coast Initiative's website reads as though our oyster population came through the Deepwater Horizon oil disaster with flying colors, note the closing paragraph where it indicates that the data may be skewed due to the timing of the research study, and the "possible" lack of exposure to oil. Well, isn't that the goal of the research? To determine the direct effects of the crude oil AND Corexit on the food chain? As oysters are filter-feeders, and, are part of Mother Nature's water purification system, additional, continuing research needs to be conducted. Nearly three years post oil disaster, some of the most horrific ramifications to the Gulf of Mexico and its inhabitants are just now becoming apparent. If the oyster population hasn't been harmed by the spill and the Corexit, then why is Apalachicola Bay a dead zone - its oyster population nearly extinct? I guess my point is this: Take everything you read with a grain of salt. Just because it is "written," doesn't mean it's true! Especially where research was made possible by "big oil" funding. AND CONSIDER THIS... perhaps there is no discernable difference pre and post the BP oil spill, because crude oil has been leeching into the Gulf for a much longer period of time than the oil companies, and the government will admit to. Separate groups of scientists studying the Deepwater Horizon oil spill impacts on oysters along the Gulf coast recently published their findings in two journals: the November 2012 issue of Environmental Science and Technology: Assimilation of oil-derived elements by oysters due to the Deepwater Horizon oil spill; and the December 2011 issue of Journal of Shellfish Research: Chemical and physiological measures on oysters Crassostrea virginica from oil-exposed sites in Louisiana. Drs. 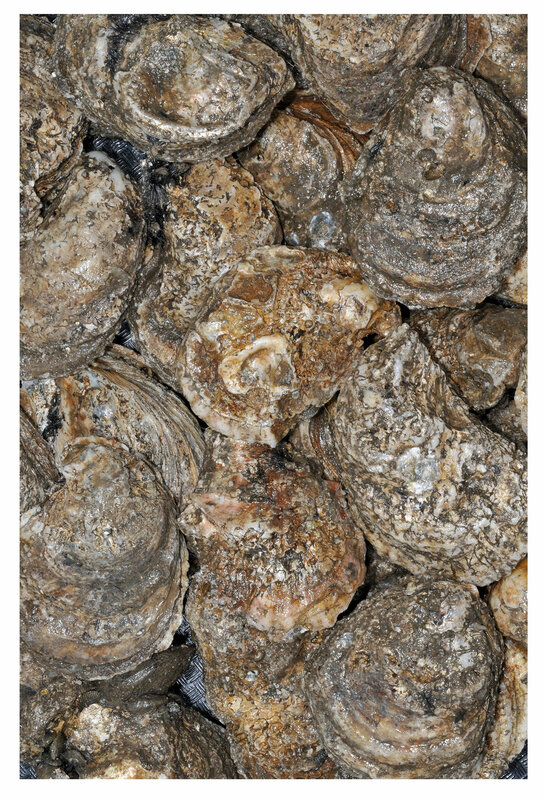 Ruth Carmichael and Thomas Soniat led studies using the eastern oyster, Crassostrea virginica, as an indicator for potential oil spill effects on local food webs along Louisiana, Mississippi, and Alabama coasts. Oysters are a species of choice for ecosystem studies because they are economically and ecologically valuable to the Gulf region and because their tissue and shell act like powerful recorders of their environment. 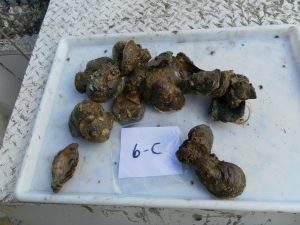 indicate exposure to oil hydrocarbons, in new shell growth of oysters as well as in their tissue. Researchers analyzed stable isotopes in oysters and in suspended particulate matter available as food and compared them with weathered and fresh oil. Neither study found evidence of oil-related contamination at levels above prior background or pre-spill conditions. Soniat’s results found that PAH levels, environmental conditions and reproductive capacity in oyster samples were similar in oiled and unoiled areas six months after the capping of the wellhead. 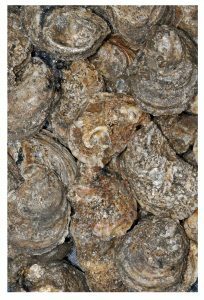 Carmichael’s results found that oil-derived elements did not have a statistically significant influence on the stable isotope composition of oyster samples. Soniat cautioned that his group’s results not be over applied because of the study’s spatial and temporal limitations. Carmichael suggested that her group’s findings have alternate possibilities including the oysters not consuming oil materials during their period of study or oyster samples consuming too little to detect. 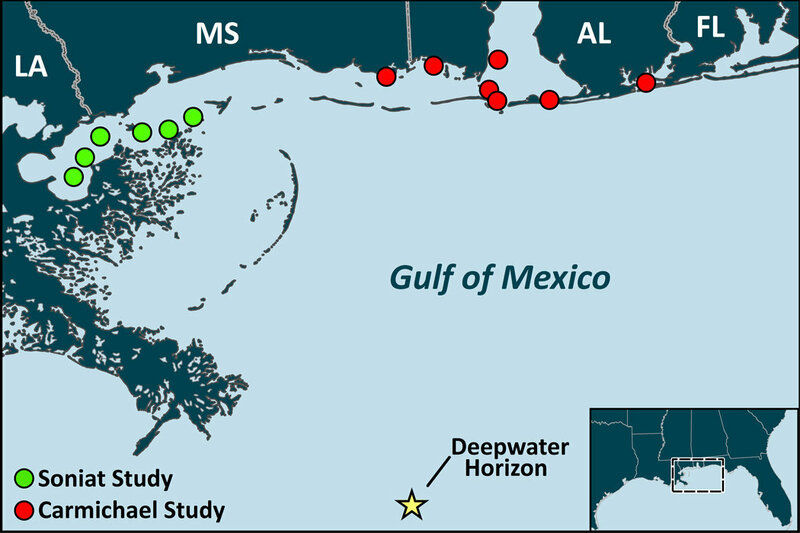 Both studies point to complexities in interpreting and isolating potential effects of the Deepwater Horizon oil spill. (Click to enlarge) Oyster sampling sites along the Gulf coast for studies led by Dr. Thomas Soniat and by Dr. Ruth Carmichael. Ruth H. Carmichael, Amanda L. Jones, Heather K. Patterson, William C. Walton, Alberto Perez-Huerta, Edward B. Overton, Meghan Dailey, and Kristine L. Willett (Environmental Science & Technology 2012 46 (23), 12787-12795); and Thomas. M. Soniat, Matthew A. Tarr, and Megan A. Thorne (Journal of Shellfish Research 2011 30, (3) 713-717). This research was made possible in part by Grants from BP/The Gulf of Mexico Research Initiative (GoMRI) through the Alabama Marine Environmental Science Consortium and the Northern Gulf Institute . The GoMRI is a 10-year, $500 million independent research program established by an agreement between BP and the Gulf of Mexico Alliance to study the effects of the Deepwater Horizon incident and the potential associated impact of this and similar incidents on the environment and public health. Try, by Pink. Thanks Peter. 10 Wonders Of The Universe - a Must Watch!